Staff photo by Katherine Glosser Two-year-old Wesley Bennett has fun jumping and bouncing around at Altitude Trampoline Park in Merrimack. Staff photo by Katherine Glosser Stephen Payne, owner of the Merrimack’s Altitude Trampoline Park, explains how to play one of the park’s games, Wipeout. Payne said the company aims to encourage physical activity for all ages. Staff photo by katherine glosserAltitude staffer Kyeline Cing helps 2-year-old Wesley Bennett plays with plastics balls at the trampoline park. 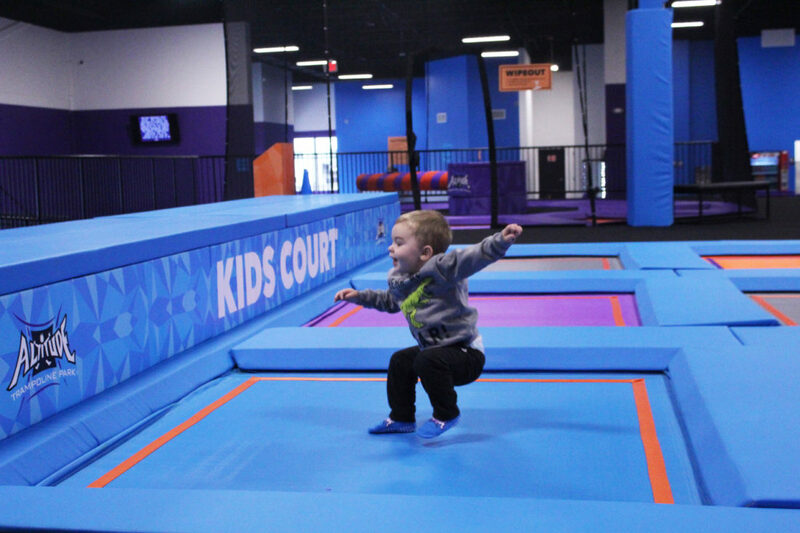 A newly opened trampoline park already is jumping with business. 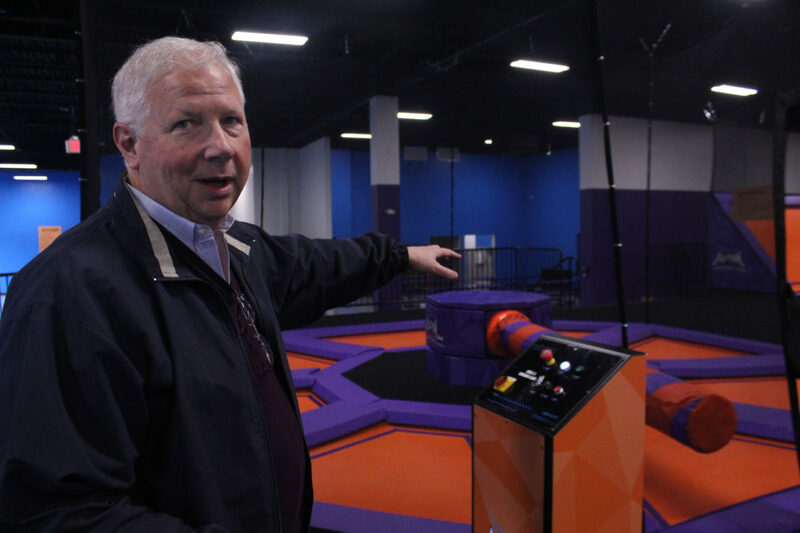 Altitude Trampoline Park – a local franchise for a chain that has 60 facilities across the United States and also is in at least 10 different countries – is located at 360 Daniel Webster Highway in Merrimack. 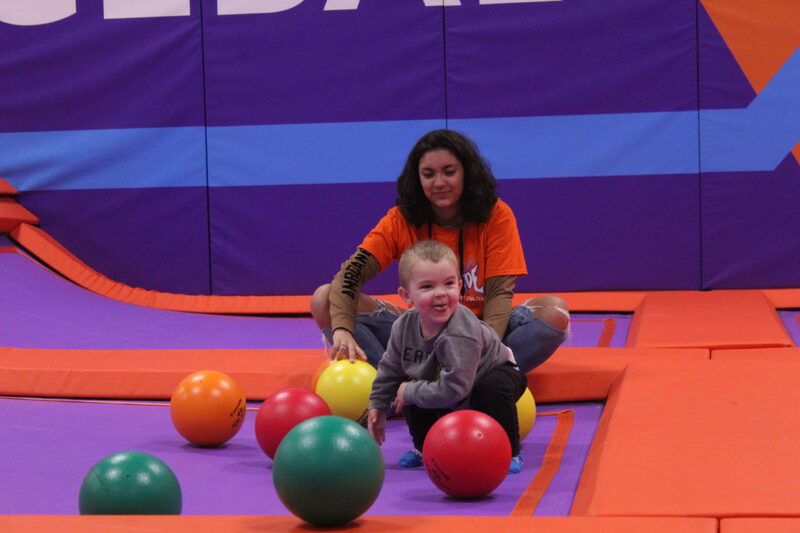 With a maximum capacity of more than 200, customers can spend hours jumping on trampolines, playing games involving physical activity and celebrating birthdays or other special occasions. Stephen Payne, who co-owns this location as well as the Marlboro, Mass., and soon-to-open Concord facility, said the company aims to encourage physical activity. Anyone age 2 or older is eligible to jump, providing they meet health and safety requirements. Those who are younger than age 18 must have a waiver signed by a parent or legal guardian to access the facility’s attractions. The facility’s general manager, Dan Huckins, has worked for four parks in the past, and said he encourages a positive guest experience. “We’re friendly, our rules aren’t as strict, at least that’s what I heard, and that’s why I try to have the staff portray when they’re working to be friendly, engage with the customers, talk with them and play with the kids,” Huckins said. One of the jump experiences at the park is Wipeout. It features a padded spinning wheel that tries to knock a player down, and the person has to use the trampoline to jump over it. Customers also can battle each other gladiator style, where they use a padded rod to knock their opponent into a foam pit. Another game is the High-9 Reaction Wall, where players have to jump and press buttons attached to the wall and compete for the most points. Jumpers also may use a rock wall with a foam pit underneath it. Monkey bars that stretch over a foam pit and trampoline floors also are there for customers to have fun with. There also is a Kids Court for the little ones. Other youth-themed activities are toddler time, sensory-friendly Saturdays and teen nights. Friday targets tweens and younger teens, while Saturday’s experience admits guests 13-17. Merrimack resident Siana Gakis, who recently visited the park with friends, said she enjoyed the experience. Single jumping rates begin at $9, and special Altitude Trampoline Socks are required for purchase at an additional cost $2 per pair beyond any admission fees. To learn more about Altitude, log on to altitudemerrimack.com.